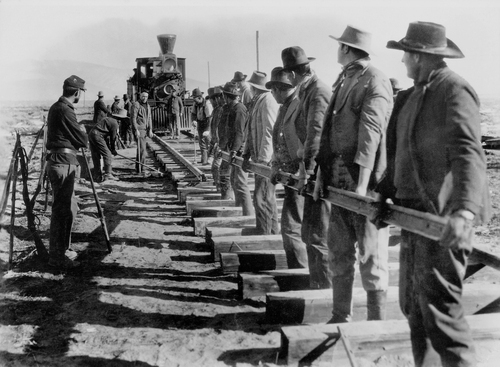 I can imagine the toils of the men who built the Overland Route: sweat beading, muscles straining, hammers arching high and falling sharp with a metal-on-metal clang, driving spikes into the dirt. Again and again—so many times that they sang songs of it as they worked. And month after month—for so long that their wives and children and indeed their whole towns moved along with them across the miles. Home was where the work was. John Ford’s The Iron Horse is about this story, and it will sweep you up in its greatness, given time—the greatness of the story, I mean. As for the greatness of the movie, that depends on your taste. For the first hour or so it feels like something you’ve seen a million times, and I think, for some viewers, it will never be more than that. It is formulaic, populated with vaudevillian archetypes, and frankly, could have used sound. But The Iron Horse also escapes its trappings. It makes you care about the people in it, by acknowledging that even archetypal characters in classic straits face real consequences, perhaps as a result of the roles they must play. There is real tragedy and real conflict here. And if that doesn’t win you over, there’s still the pleasure of witnessing genius in development: the work of a young John Ford, who already knew how to make simple gestures into huge moments. The basics: in the early-1850s, a boy named Davy Brandon leaves town with his father, in search a shorter passage for the (still-theoretical) Overland Route. Mr. Brandon’s just a dreamer, says his friend, Thomas Marsh (Will Walling); but he’ll miss the man. Marsh’s daughter, Miriam, will miss Davy far more. Davy’s dad indeed does discover a shorter route, through a gorge, but before he can pass this information along he’s attacked by a band of rogue Cheyenne, led by a white man with missing fingers, who murders him in front of his son. Two things will strike you about this scene: first, the acting job delivered by Winston Miller as Young Davy, a performance so horrible you’ll wish he’d taken the axe instead of his dad. Second, the muddled racial politics behind the Cheyenne leader, a man later identified as ‘Bauman’ (Fred Kohler); whose bone structure is Caucasian but who seems darker than the Native American extras flanking him. The implication, I think, is that Bauman’s mixed-race, which means a lot in a silent film, since mixed-race people were often portrayed as diabolical, as were non-whites, of whatever race, who blended into white society. Bauman manages to be both in The Iron Horse. Characters like Bauman provided racist writers with an out. It’s difficult to simultaneously degrade a race of people and present them as a threat, so we’re given these biological intermediaries, who provide credible amounts of brain to lead the brawn. It is Bauman, therefore, who must incite a perfectly capable Cheyenne chief to attack the train, even though there’s no suggestion the Cheyenne were passive before. The Native Americans in this film are not independent thinkers, but something to be influenced, directed; like diverting a river to flood a town. They are bit players in their own story. Years pass. The goal of linking East and West by rail becomes U.S. government policy. Davy grows into a solid-looking Pony Express rider (now played by George O’Brien); Miriam is now a lovely young woman (Madge Bellamy) engaged to Union Pacific Railroad’s chief engineer, Peter Jesson (Cyril Chadwick). Miriam’s father now backs the project with substantial cash, but he can’t continue unless he finds a shorter route than the one through Cheyenne country that Jesson favours. If the railroad continues as planned, it will benefit only the chief landowner in that area—Bauman. 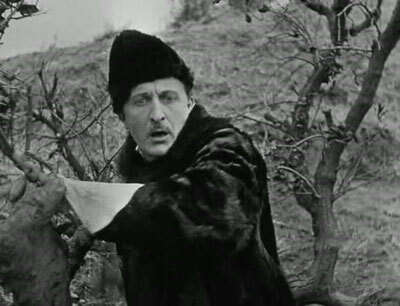 Bauman has long since traded his Native garb for a fur coat, and keeps his right hand in his pocket at all times. 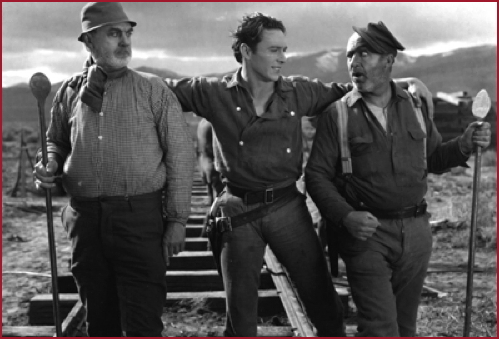 Between these serious moments we see glimpses of the labourers: Chinese, Irish, Italian, and so on, building the railroad and lightening the mood. ‘Diversity’ in The Iron Horse means jumbling all these stock characters together and letting them fight amongst themselves, but the results can be funny, especially when they involve ‘Judge’ Haller (James A. Marcus), a blusterer with dubious credentials, whose mobile saloon also serves as the town’s court of law, wherever the town happens to be at the time. George O’Brien plays a variation of his Sunrise (1927) character here—another brawny, unusually handsome young man who’s aware of the right thing to do. In this case, though, he’s inclined to actually do it. And he faces a comparable temptation in Miriam, who, for all her exhortations of destiny and the greater good, pretty shamelessly falls for him the moment they’re reunited. Though her fiancé does stray, there is no doubt that Miriam would do the same, given time. And this makes Jesson a lot more interesting, especially when Bauman, another alpha-male, demands that he not find the shortcut Davy’s sure he remembers. You have to wonder how Jesson landed Miriam in the first place. He’s older than she is, shy and stern, bookish… was it his money? Was he judged a ‘good match’ by her father? Jesson is a man buffeted by fate—pressured and bullied into being an attempted murderer; cuckolded by a relationship that predates him; an accomplished man whose career achievements do nothing to eliminate his sense of personal worthlessness. In a simpler film, his visit to the town prostitute would have been designed to obliterate our sympathy for him, but here, I think it’s meant to show us his insecurity about almost everything. The Iron Horse feels like a transitional film in some ways. It shows us the limitations of the silent aesthetic when telling this kind of story: without the sound of hooves clopping, birds singing, wagon wheels rumbling and gunshots cracking, you simply aren’t there, no matter how well Ford shoots the rugged American terrain. It doesn’t help that The Iron Horse brims with caricatures, many of them in heavy makeup, acting in a pose-heavy silent style, highly symbolic and unavoidably artificial. I’ve never seen a Western I’d call truly abstract, and perhaps this is why. There are also moments that seem downright theatrical—old-fashioned even for 1924—like one scene set in Judge Haller’s courtroom-bar, shot wholly at medium range with obvious choreography; or another involving three Irishmen paying a visit to the local barber-dentist, which could have been a standalone comedy short of the 1910s or even earlier. And yet, some scenes incorporate the silent feel to great effect, notably those of the workmen robotically laying-down track ahead of the ever-advancing train. This scene didn’t look real to me, but I believe I’d have felt the same way even if I witnessed it happen. In that moment, the men, the machines, the tools and the job—and the drive, the purpose and the destiny behind it—blur into one compound act, and since the result must be ever more, ever faster, and always the same, it is toward the machine that the men cleave, not the other way around. Such a moment, I believe, benefits more from musical accompaniment than sound. There’s a reason those men sung as they worked. The Iron Horse is available as part of the massive Ford at Fox box set. Only a fraction of John Ford’s silent films still exist. I consider that one of film history’s greater tragedies.